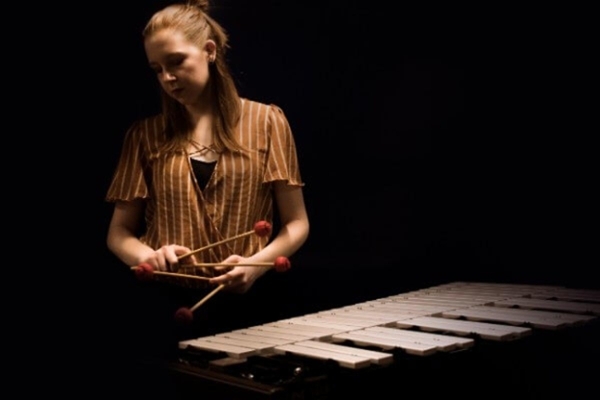 The Department of Music at SUU will host Lindsey Eastham, percussionist with the un/pitched Metamorphosis Project, Saturday, March 30, 2019, at 7:30 p.m. in Thorley Recital Hall of the SUU Music Building. This exciting concert is free and open to the public. Lindsey Eastham is a contemporary percussionist from southern California. With un/pitched, Eastham has commissioned and performed six new percussion trio pieces. As a part of the Metamorphosis Project, she debuted four new vibraphone solos to audiences across the United States. Eastham holds a Bachelor of Music degree from California State University, Northridge; a Master of Music degree from Ithaca College; and will be continuing her studies at Trinity Laban Conservatoire of Music and Dance in London beginning Fall 2019. She is proud to endorse Marimba One as a discovery artist. The Metamorphosis Project is “aimed at examining the remarkable dynamic between the composer, the performer, and the instrument. By commissioning and presenting four new works for solo vibraphone and auxiliary percussion instruments, the Metamorphosis Project will highlight each composer’s unique voice by employing the same instrumentation throughout the entire program, allowing an evolution of possibilities to unfold in the hands of the performer and their instruments.” un/pitched would like to thank Marimba One for their support of this project and tour. Experience the exciting narrative of un/pitched and the Metamorphosis Project on Saturday, March 30, 2019. For more information about un/pitched, please visit www.unpitched.org. For more information about the Department of Music at SUU, please visit www.suu.edu/pva/music.